The Franklin had been the family car in the forties and fifties. It made the trip to Los Alamos from Indiana. For most of my young life it sat in the back yard in a metal shed under a couple of tall pine trees. Next to the shed was a frame of a home built RV that was started and never finished. The RV body was filled with rusting metal and scraps that had been saved as raw material for future projects. That part of the yard was a wonderful place to play as a kid. Luckily, no one ever ended up with tetanus or hantavirus. A few yards past the shed and Franklin, the yard turned to scrub oak and boulders, and then it dropped off into a shear cliff at the edge of the Mesa. As a child, I thought the canyon went down forever. Looking at it on google maps, I am not so sure it was that deep. My grandfather became know in the neighborhood as the guy who collected old bicycles. 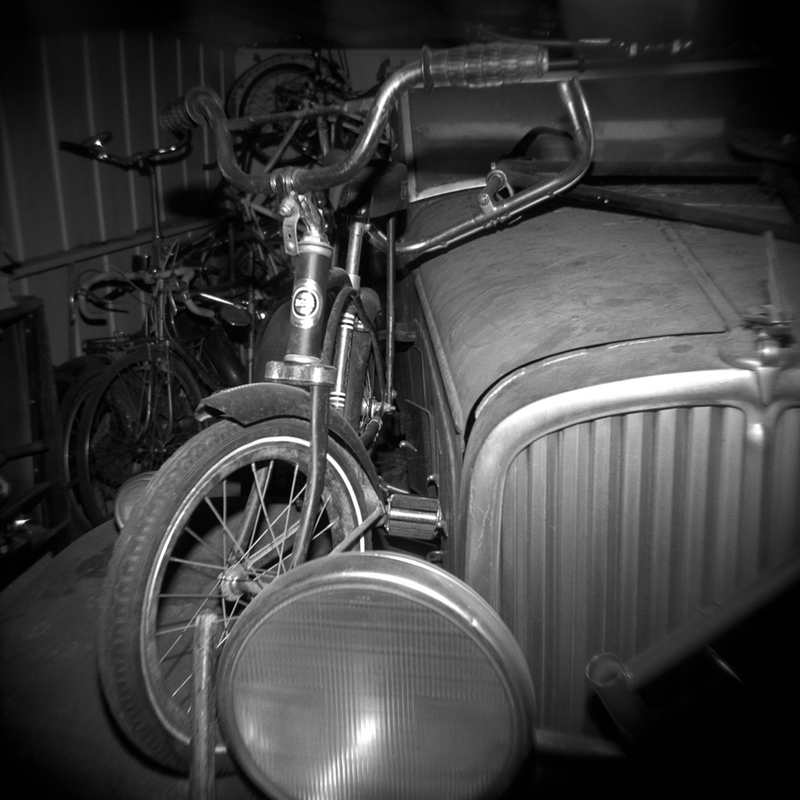 Every ten broken speed on the block ended up in the shed, along with the bikes that the family outgrew or left behind. The small bike in this image had been mine. It was a Christmas gift in 1976 or 77. My cousins Beth and Leon inherited it at some point. My grandfather expected toys to get a couple of generations worth of use. A friend just told me he found the images "evidentiary" in the sense that Weegee's images blasted away at crime scenes with a similar flash. I appreciated the sentiment, although I don't think my images stand up to a comparison with Aurthur Fellig's. I don't get to claim any forethought on the question of lighting. I wish I had known more about off-camera flash then. I was drawn to photograph there because I was haunted by my childhood memories of time spent in that house and around the city. In that way, maybe the strange lens of the Holga and the relentless blast of the on-camera flash makes sense. The images are about searching dark recesses and remembering in an imprecise way.